Kalinaw kanimo! Peace be with you! This is the advocacy platform that anchors the rest of the humanitarian campaigns of the Initiatives for International Dialogue (IID), a regional advocacy institution promoting south solidarity and peacebuilding in several countries in the Southeast Asia region, namely, Burma, South Thailand, Aceh, Timor Leste and Mindanao. 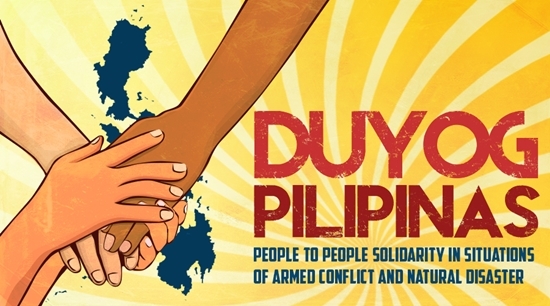 DUYOG PILIPINAS is our on-line community space as we mobilize solidarity support and humanitarian action for the survivors of the recent disasters in Visayas Islands and the Zamboanga conflict. With Visayas and Mindanao restive over guaranteeing stable, safety communities, and a more durable peace process – IID reaffirms Human Security as one of its overarching framework that guides this advocacy program. Moreover, after the string of tragedies our country experienced lately, it is undeniable that climate change is here, and it is incumbent upon us to engage our own government and the public to integrate ‘climate change impacts’ into development planning, local governance and our own personal lives. The only thing that hopefully changes is our level of technological adaptability, enabling us to better prepare, soften their damage, and deal with their fury overall. Mindanao PeaceWeavers (MPW), in collaboration with other peace and humanitarian groups in the Philippines, are urgently appealing to both the Philippine Government and the Communist Party of the Philippines (CPP) to declare a 60-­‐day extended ceasefire in the Yolanda-­‐affected areas in central Philippines.